On New Year's Eve the celebrations usually involve fireworks. 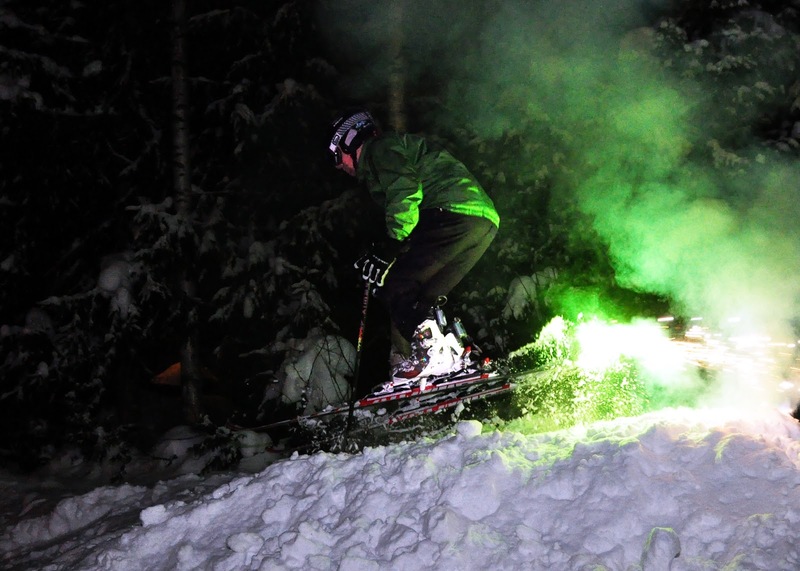 It seems appropriate to post a video about fire, pyrotechnics, and, of course, skiing. And sacrificial pagan rituals, naturally. Christmas is a good time to visit a church. I was dressed up and late from a dinner on Christmas eve. But not so late that I wouldn't have time for some quiet meditation. And a quick ski run. I visited the Cathedral of Helsinki, next to the Senate Square, and the Kallio (Rock) Church north from the center. 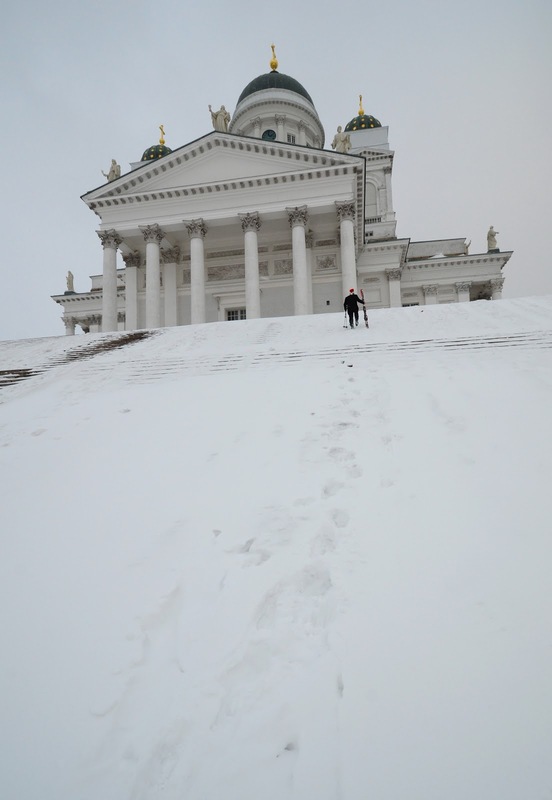 The Cathedral has stairs that are popular among kids and snowboarders during the winter. Given the early season, some of the stairs still stand out from the stone, so I was glad that I had my old skis on this run. The stairs and the slope are quite steep, and end on a narrow sidewalk and then a road. While there are always some tourists and kids playing here, be careful to not have anyone slide onto the road. While you have to be careful in the Cathedral stairs, in Kallio you need a life insurance. 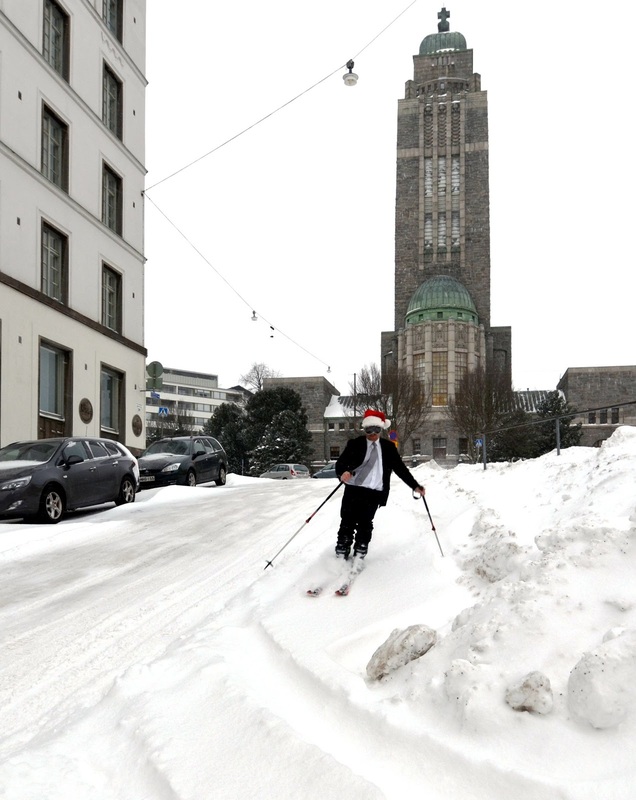 The "skiable" slope next to the church is Siltasaarenkatu, a street that leads to the city center. It is not a particularly busy street near the church, but nevertheless you have to worry about cars. Perhaps some day I'll be able to catch this road in the early morning hours, before traffic or snowplows disturb freshly fallen snow. 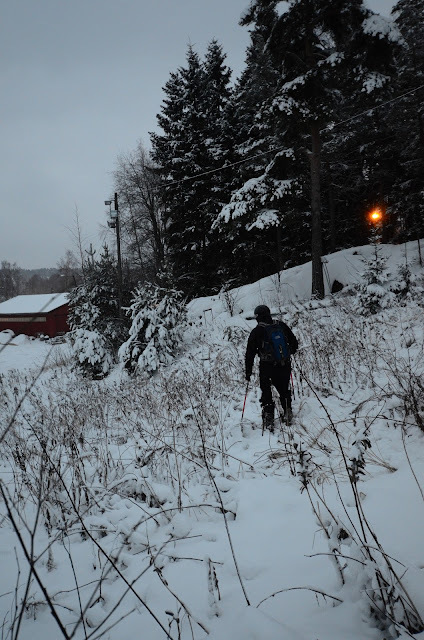 Kallio is a nice place to ski. People are friendly, and the after-ski bars are right next to the street. As I was skiing down, an old lady came out from her apartment right next to me and exclaimed "Santa Claus!". Kids: don't try this at home. 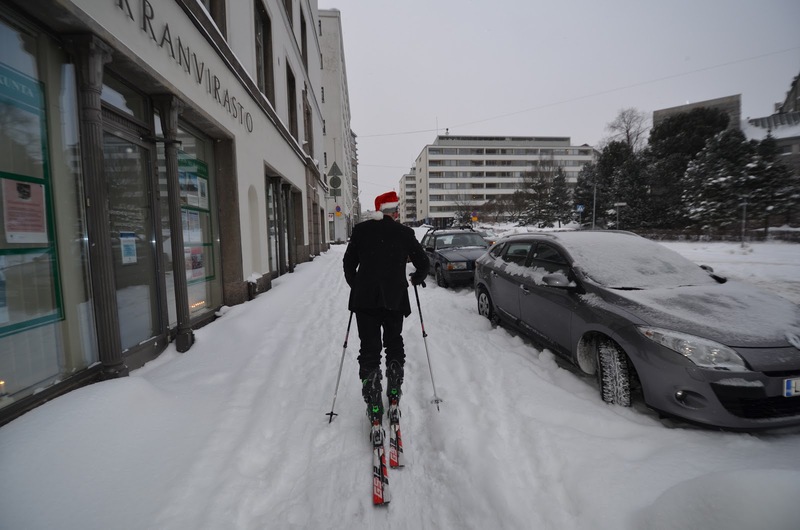 It is a very bad idea to ski on a road anywhere, let alone in Helsinki. Leave this to professionals and the insane. This is the burning question everyone has. 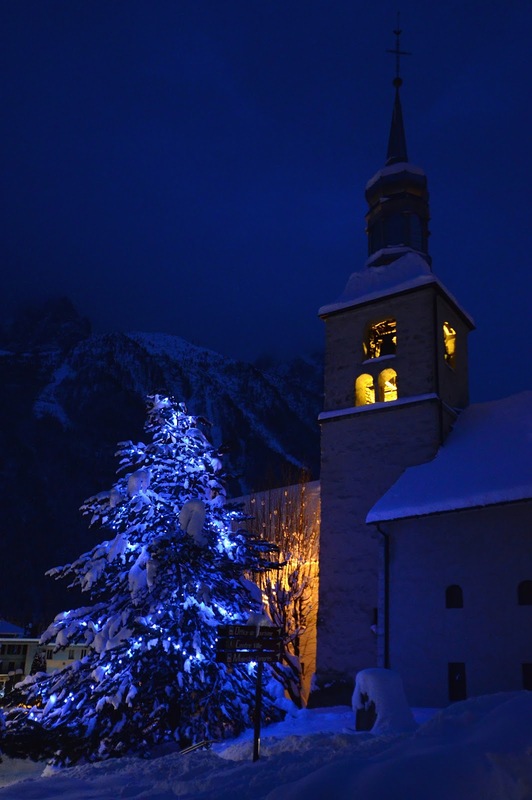 Should you spend your ski vacation in Peuramaa or Chamonix? 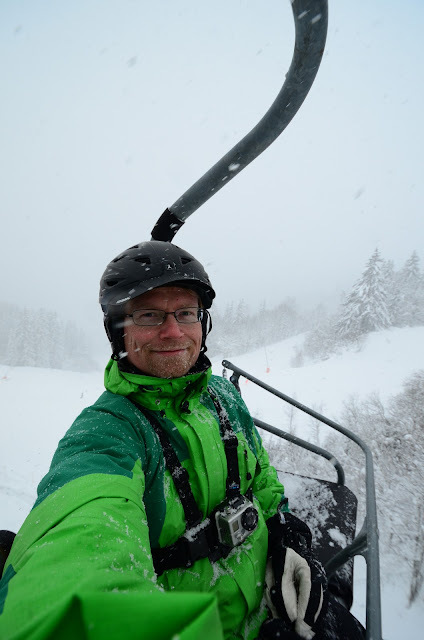 The Planetskier is here to answer this difficult question once and for all, as I was fortunate enough to ski in both places when they opened last week. I'm hungry. 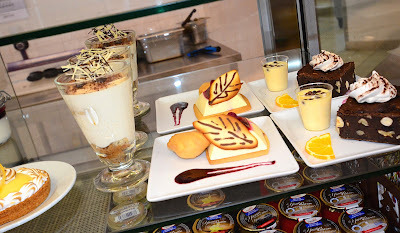 Lets start the evaluation from food. 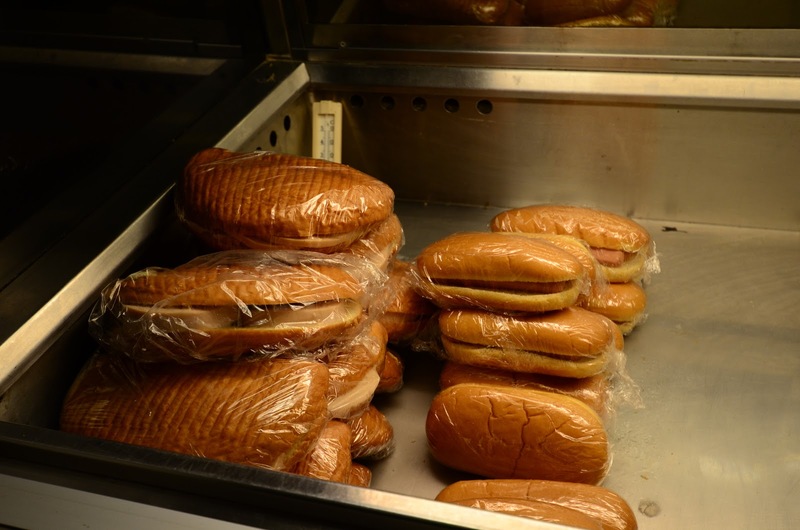 Peuramaa has a cafeteria with an ample selection of meat doughnuts (lihapiirakka). This is a traditional Finnish food item, a common item any teenager diet. It is a pie filled with minced chicken skin, bone dust, and other substances that help keep Finnish food at its low price level. 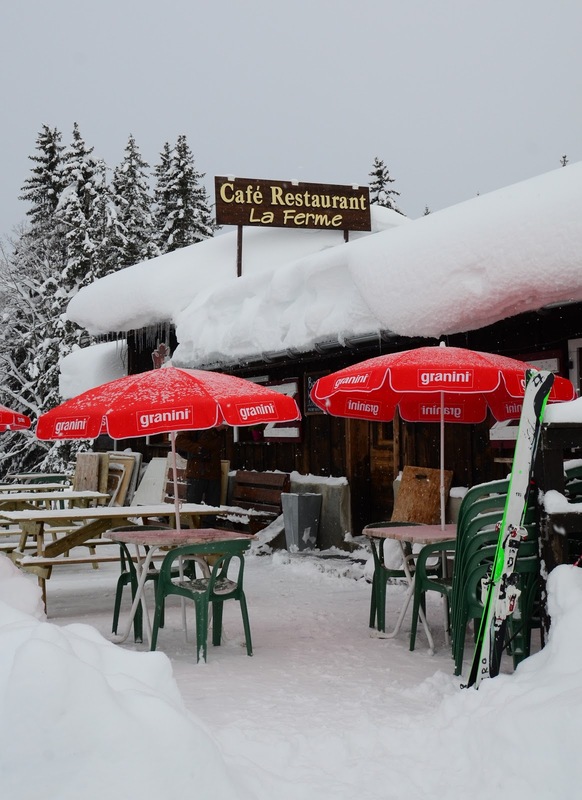 In Chamonix, I chose to sample food at the "Le Rider Café", located in the middle station of the famous Grands Montets ski area. As I entered the restaurant, my attention was drawn to the sides that they were offering in addition to the ten or so main courses. There was a good salad table. 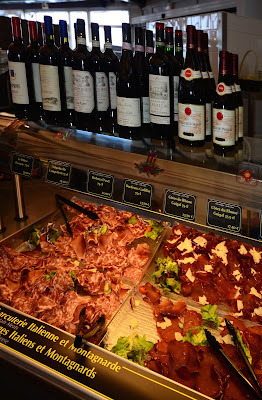 A selection of Italian meats. A dozen different desserts. And wine. Of course there is wine! In the evening I ate at the Le Caveau. This is another nice restaurant, recommended. Their kitchen is open later than in most other restaurants, so if you ended up working on your computer in the evening like I did, Le Caveau may still be able to serve your portion of frog legs. Tastes like chicken! 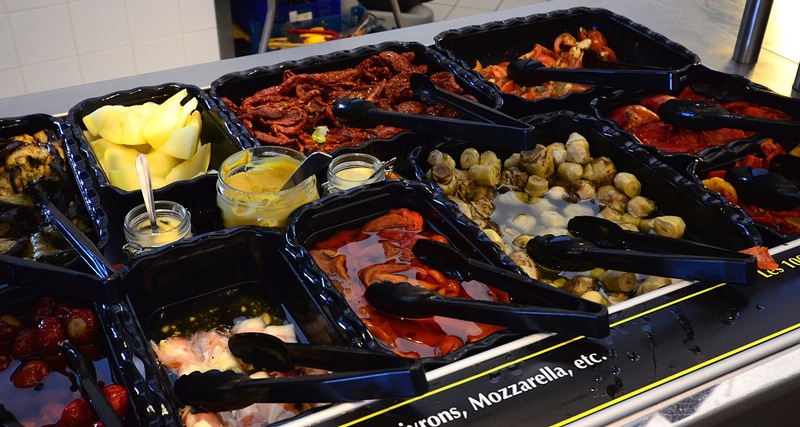 So nice food in France. Things are looking pretty dark for Peuramaa. But wait - that is not all. Le Rider Café sells Coke products, whereas Peuramaa offers Pepsi Max, my favorite drink. Hmm. This may change the situation. But more importantly, I had spent the morning climbing up 350 meters from the highest open lift, and, exceptionally, I ordered a steak to replace the lost calories. After a lengthy conversation with the cook, I got my plate. The steak was practically raw. And cold. I guess I need to learn French to make more accurate orders. So far the only words that I know are "Piste Ferme", which seem to indicate a good ski slope. Winner: Peuramaa. Meat doughnuts have never been served cold in Finland. And you can order in Finnish or English. Eller på Svenska. 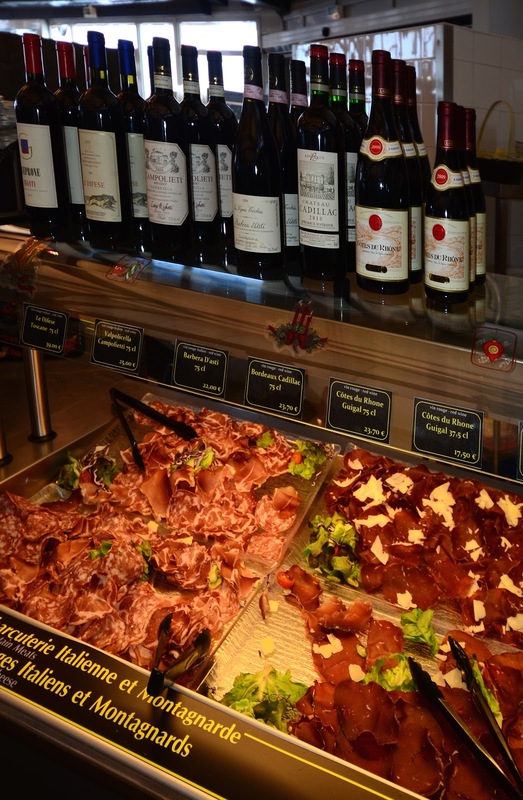 Chamonix has numerous bars to entertain you. Peuramaa has... a dark, snowy field. With no people. If you drive out of the ski area, you can find some bars and restaurants. 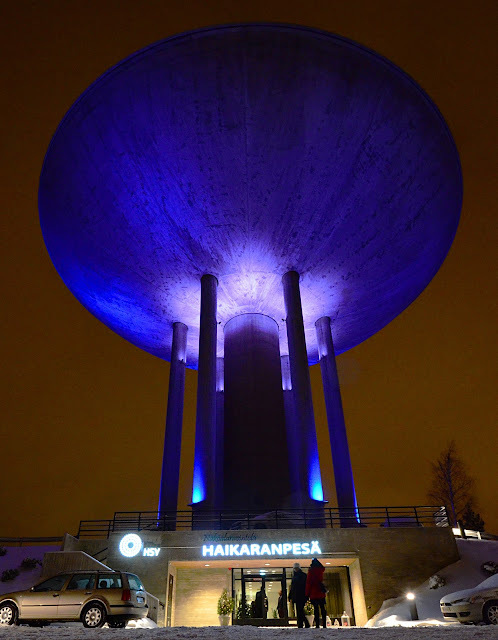 We wanted to drop by the nice looking restaurant 30 kilometers away, Haikaranpesä. But of course they close in the winter by 4pm. 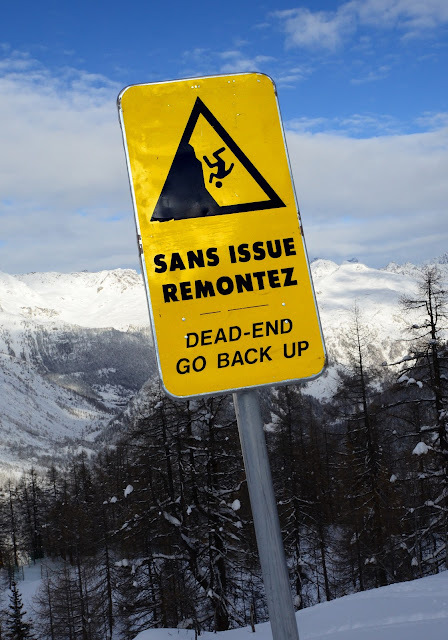 So no after-ski. I guess that was all, or am I forgetting something? Maybe I should mention the skiing. It is great in both destinations. These ski runs are closed. For a good reason. The slopes in Peuramaa are a bit dull in my opinion, particularly if they have opened only one of them. Fortunately there is plenty of playground in the areas next to the slopes. 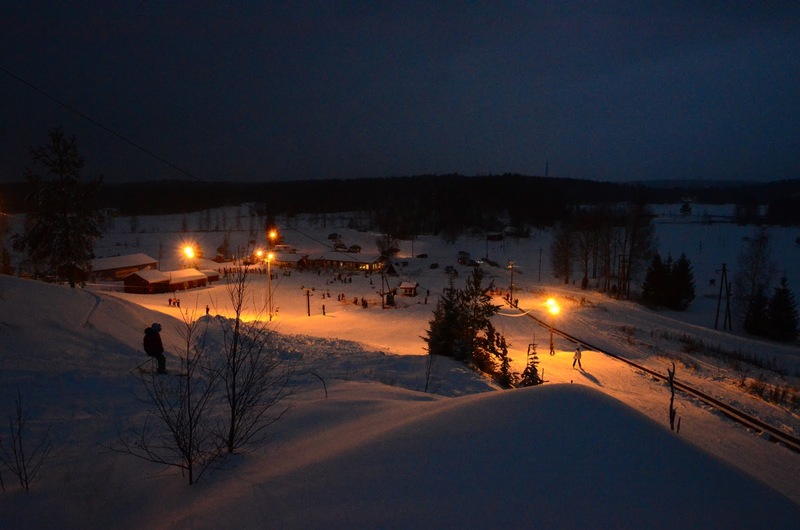 This time I enjoyed skiing through the trees next to the children's slope, descending the cliffs at the top of the same slope, and skiing through wild chervil fields on one of the closed ski runs. This was a lot of fun, as long as you remember to clean your bindings from all the grass at the end of the runs. 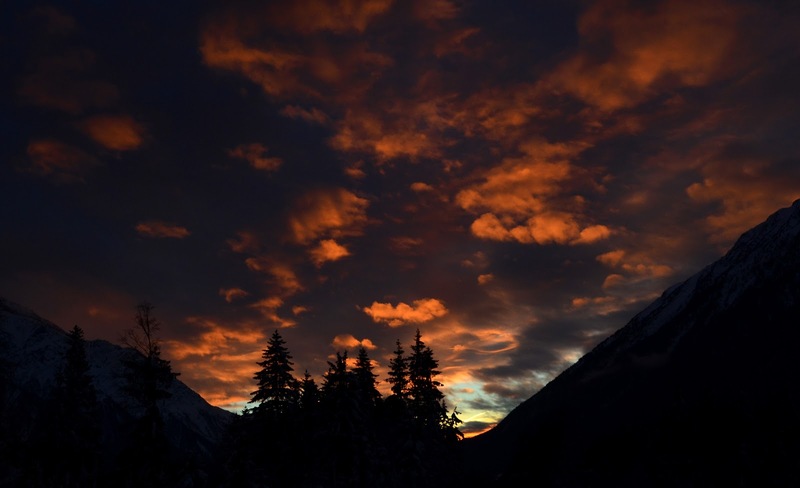 The three days that I spent in Chamonix were equally inspiring. The crowds had not yet arrived, and it had been snowing the entire week before the opening day. 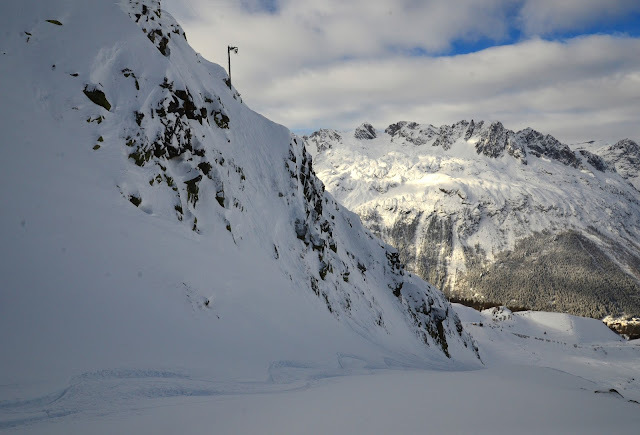 So I spent most of my time skiing powder fields in Argentiere, under sunny skies. On the first day I had to rent skis, avalanche probes, and shovels, as the airline has lost my ski bag. There was half a meter of powder in the slopes, but I was not having fun. Skiing was difficult, energy-consuming, and I kept falling down. A problem with the snow, equipment, or (gasp!) skills? I suspected the latter, but the next day when I got my own skis I noticed a world of difference. The rental skis were very similar to my own, but a bit shorter. This was enough to make me sink in the snow. With my own skis, I was able to surf on the top of the snow effortlessly. 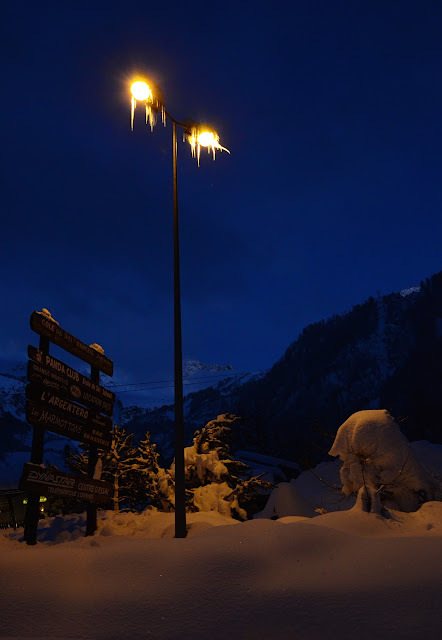 On the third day the visibility was poor, so I opted to go skiing in Les Houches. This area is usually for beginners, except that when it is snowing it is also the best place to ski powder. The lower altitude and forests make it possible to see something, and get some protection for the harshest mountain elements. 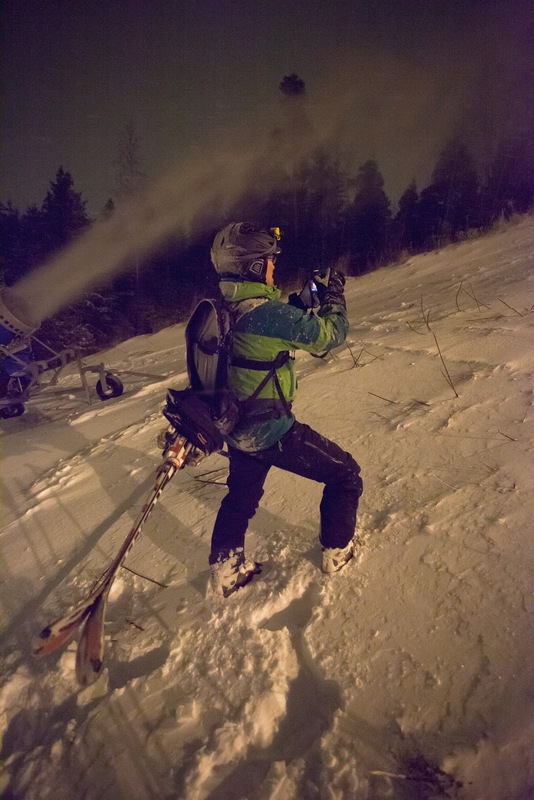 Remember the after-ski opportunities in Peuramaa? The accommodation options in are either the same, cold field or a barn with horses. 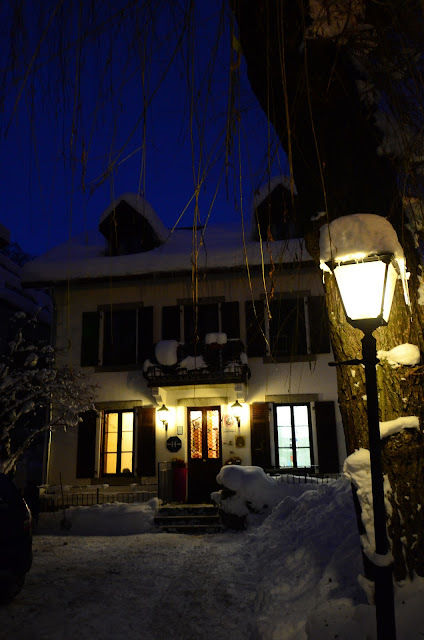 Whereas in Chamonix, there are nice hotels such as Hotel du Clocher, an inexpensive (60€) accommodation right in the middle of Chamonix. And with very friendly staff. Despite the lack of meat doughnuts and other issues in the food side, I have to declare Chamonix as an overall winner in the this contest. It has better skiing, duh! Peuramaa's 55 meters of vertical vs. 3000 meters in Chamonix. But if you want lihapiirakka, go to Peuramaa! "In alpine skiing, for every 1000 people skiing in a day, on average between two and four will require medical attention. Knee injuries account for 33 percent of injuries. Most accidents are the result of user error leading to an isolated fall." That is a large number! Lets say three persons require medical attention per day, i.e., 0.3%. On my typical ski year, I'm on the slopes for forty days. (I'm ignoring the fact that many of these days are just evenings or other short visits.) If I calculate the likelihood of having had an accident in the last five years, it comes out to 45%. I guess I'm closing in on the likely accident at 50%... But I am actually a bit surprised that I've never had a major problem. Of course, I'm a very safe skier. Yeah right. Issuet on remontissa. Mee takas ylös! I am sitting again on my usual ski bus. AY 2867, from Helsinki to Geneva. This is my second time on this flight this season, and it is early December! My third time on this route will be in January, and I wouldn't be surprised if there will be more. I am going to Chamonix, as they are opening today. Chamonix is obviously a wonderful place to go skiing in, I know my way around there, it is a short drive from the airport, the village has plenty of nightlife, and it is one of the prettiest mountain views that I can think of. However, I must confess that I was looking for other options for this weekend. Unfortunately, since it is independence day weekend in Finland, many people took the opportunity to fly somewhere else, and I had trouble finding weekend flights to any destination. Anything in Finland was completely out of question, either on airplanes or trains. Early season was another problem. That dropped Kartalkaya, Turkey, from my list of possible destinations. Too bad, maybe I can do it on some other weekend. But it is a shame. I would also have loved to experience the cheap Aeroflot flights to get to Turkey via a slight Russian detour. 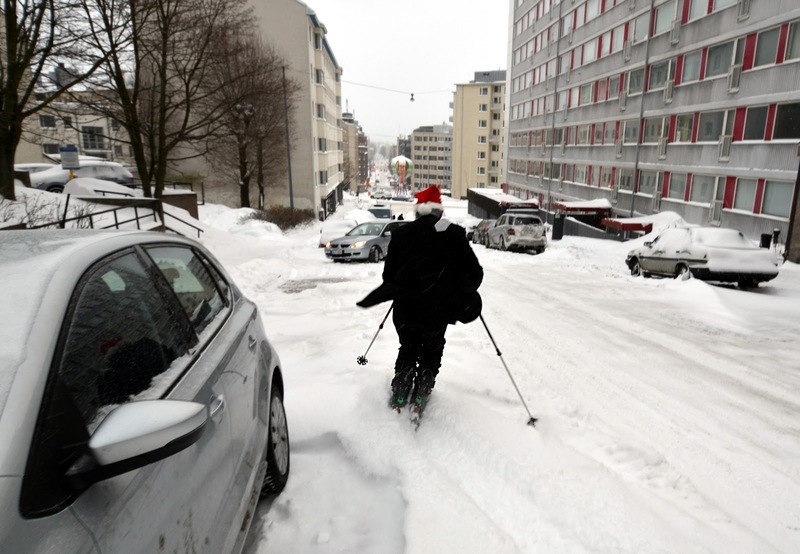 Similarly, plenty of snow has fallen into Stockholm in the last few days, but none of the ski hills are open yet. And other places had long visa processing times. I did not have time to leave my passport for six days to get into Moscow. In fact, I'm not sure I ever have time to be without a passport that long. 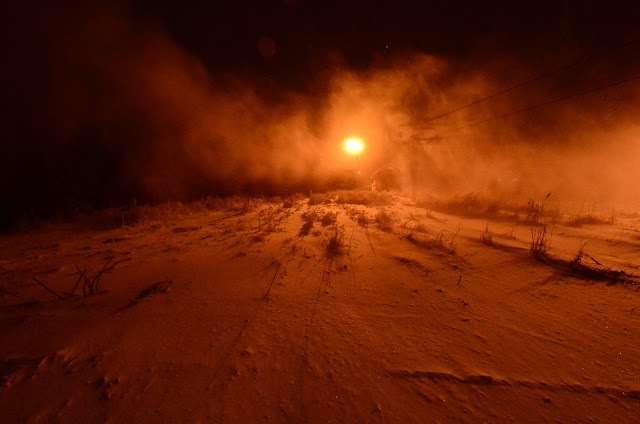 Belarus collected many problems, three days for visa processing and no snow yet. I also had some excitement coming in through the security check. For the first time, I had my avalanche survival kit, an ABS-backpack with me, and like all products of this type, my pack has a high pressure gas container and an explosives-based trigger. However, European regulations do state that you can take one ABS-backpack with you. And when not armed, they are safe to transport. So I got my pack through. But not without some questioning from security staff that was not familiar with these products. Luckily someone in the team was familiar. There were many good reasons. I had not been on a real ski slope since August. In fact, I had not been skiing at all since September, even indoors. I needed to test my new skis and boots. I needed more points to keep my frequent flier status. There was nothing else I should be doing on Saturday. And I needed the exercise. Still, it was difficult to fit a day of skiing into my schedule. I was returning from a business trip, heading straight from the airport to an office Christmas party. Can't miss those! By the time I got home, I had only an hour to pack before I needed to head back to the airport for my 6AM flight. Sleep? 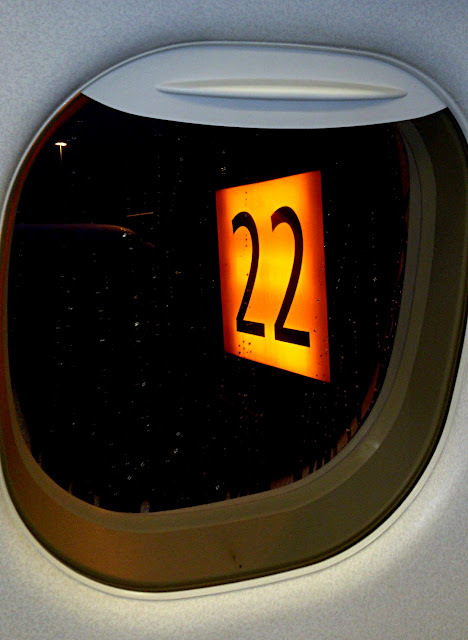 That night I only slept on airplanes. First an hour on my way back from the business trip, then three hours on my way to skiing. Not enough sleep on a regular basis, but enough to keep me awake on the road as I was psyched about opening my skiing season. At first it seemed difficult to find other options. Most ski areas that I could think of were closed. Chamonix, for instance. Then I started getting good tips from my friends. Melinda pointed out that Alyeska is open. Unfortunately Alaska was a tad too far for a day trip. Christer pointed me to an indoor ski center in Lithuania. I want to do that some day, since I have not yet skied in Lithuania. But now I wanted a real mountain. 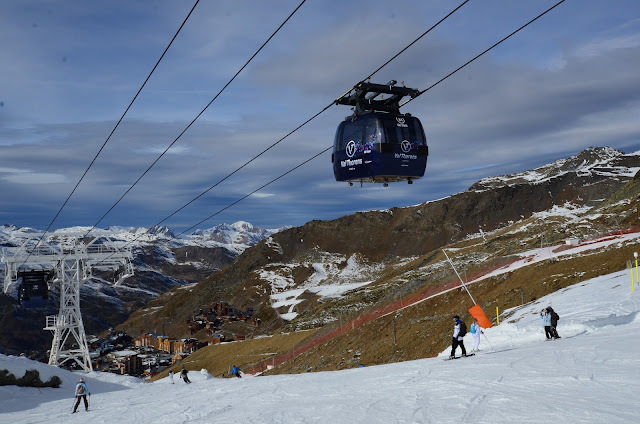 It turned out that Val Thorens, the highest valley in Les Trois Vallées had opened two days ago. I booked the three hour flight to Geneva and a rental car for the three hour drive to the resort. 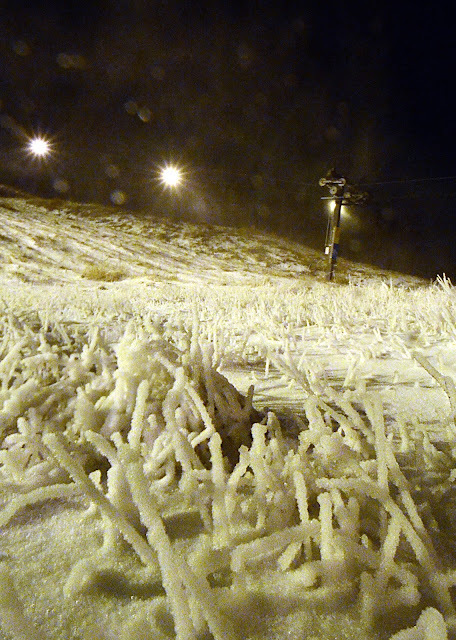 Even if I left home after 4AM and got back a bit before midnight, I had only three and half hours on the ski hill. If I had had more time, I would have had lunch and some rest. But as it was, I skied the whole time. 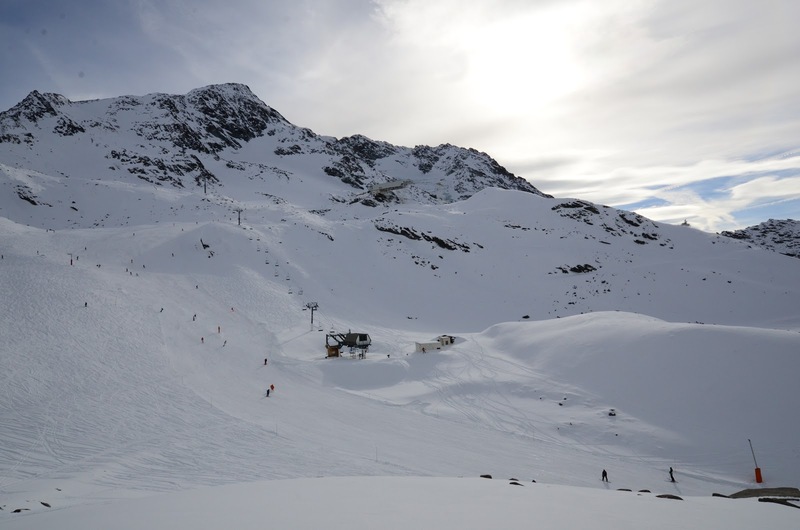 The slopes in Val Thorens were largely open. Funitel Peclet and Grand Fond were open, for instance. Cime Caron was not, nor were the south-facing slopes towards Meribel. 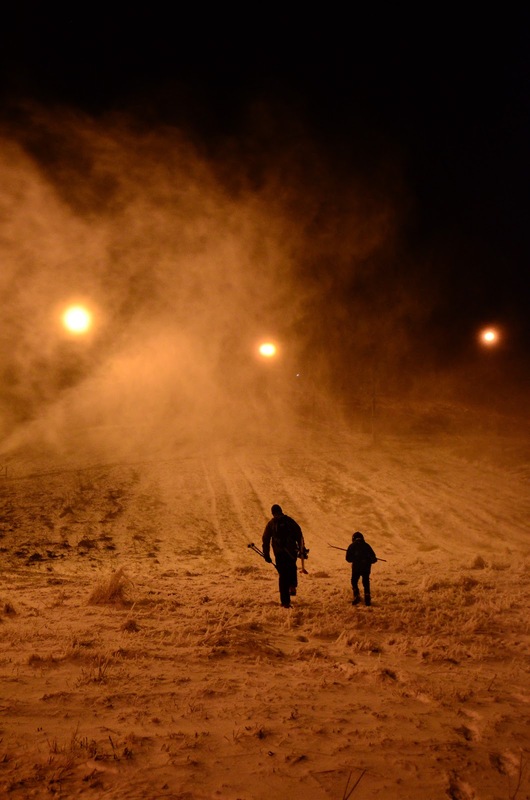 And anything lower than Val Thorens had no snow at all. La Folie Douce, the legendary after-ski bar was on those closed south-facing slopes. Oh well, I had more time for skiing. But the bar really is worth visiting when it opens later in the season. It is quite possibly the best after-ski bar in the world. Check out my report from earlier this year. There was powder and sunshine! 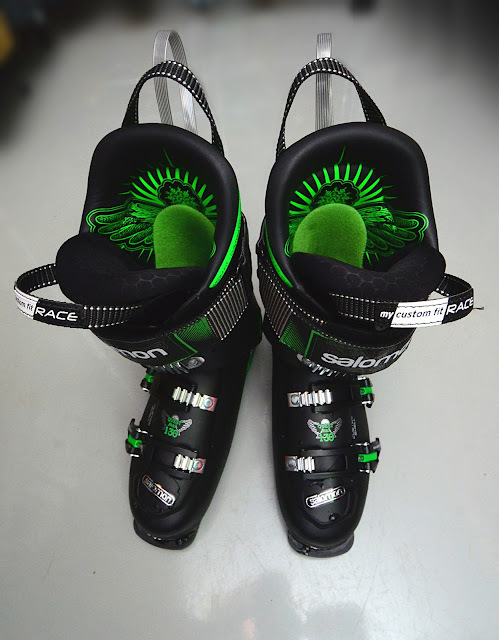 But I was in Val Thorens also to test my new skis, Salomon Rocker 90s. These are 90mm wide semi-fat touring skis that should work well in most conditions on- and off-piste. 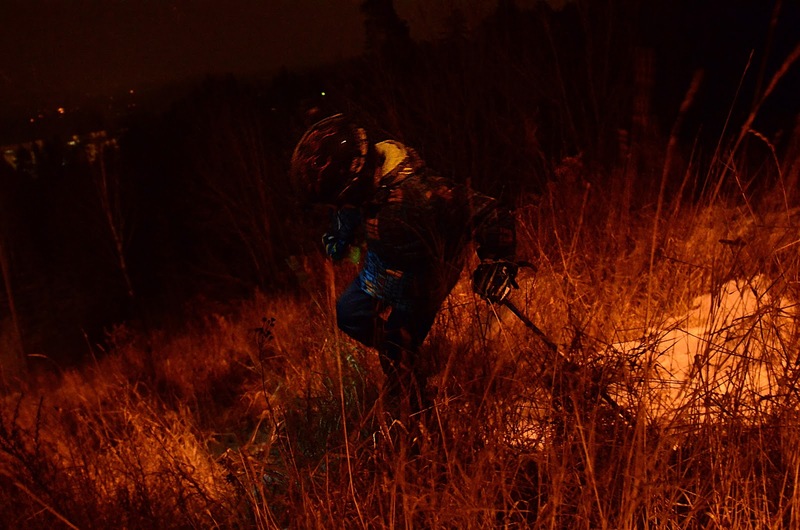 I never intended to acquire fat skis, as I do not believe in optimizing the skis for the easy conditions, i.e., powder. 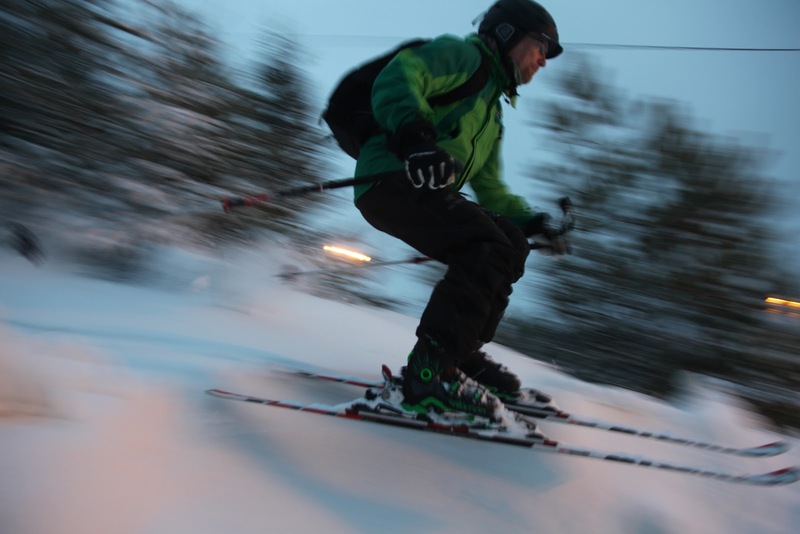 But it is difficult to get skis that work well for both touring and downhill. 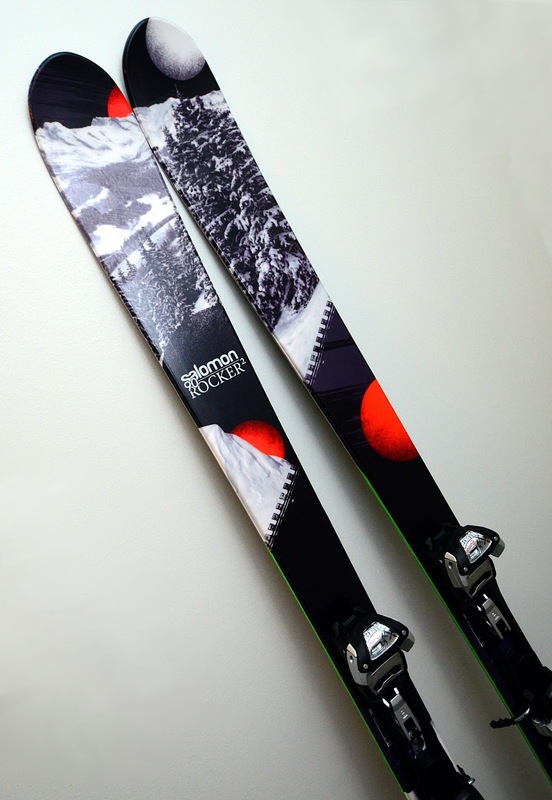 So I ended up getting all-mountain skis that were far wider than my current skis. But I still picked skis that were narrowest among the fat ones. The main issue with these types of skis is whether they work on ice and tight spots. 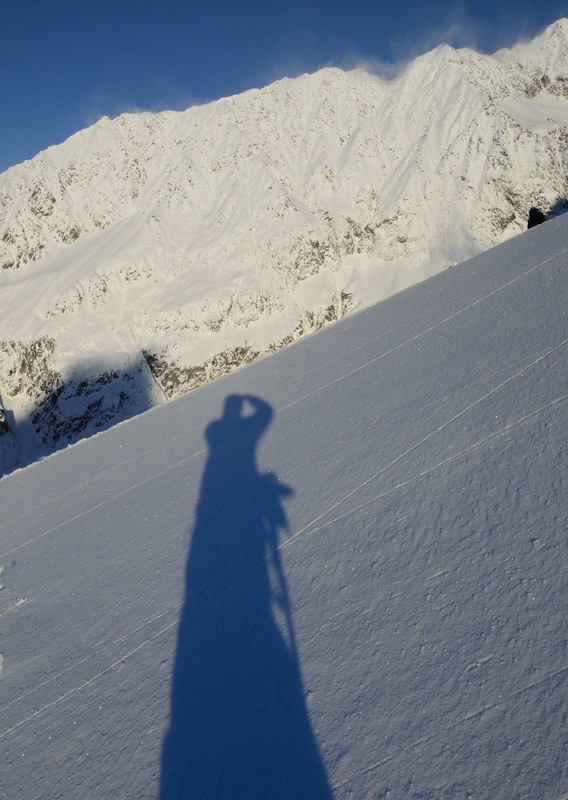 From experience, I know that I often end up in extremely narrow chutes and icy slopes. Testing in Val Thorens confirmed that that the skis work very well on powder. 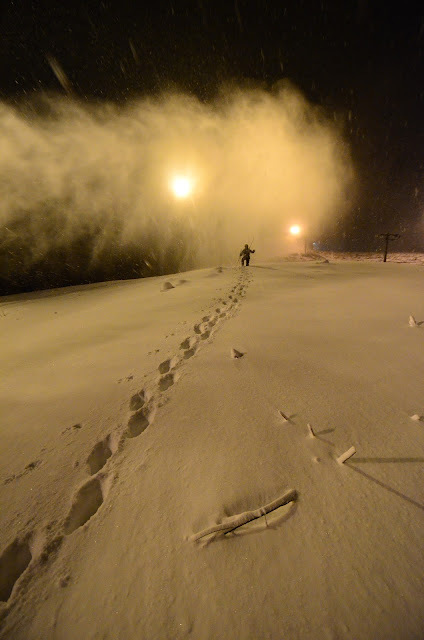 No surprise there, and it was fun to be able to ski powder far better than ever before on my previous skis. 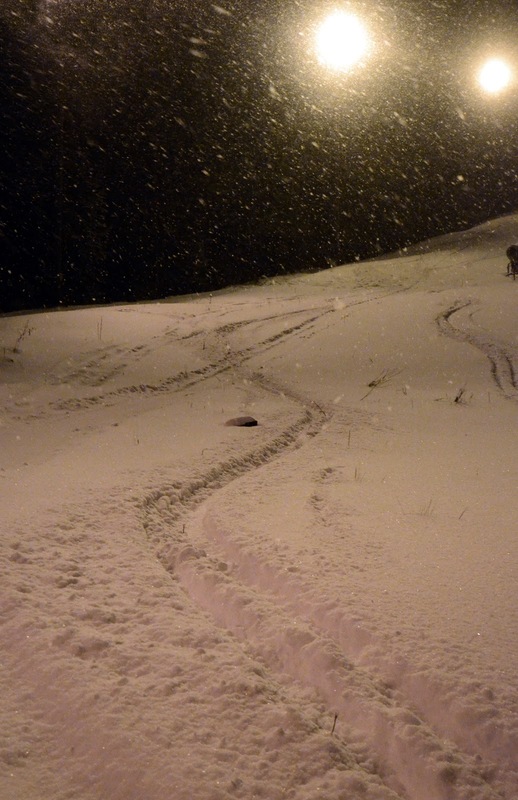 I've also had difficulties in tracked and crappy snow, and the new skis work better there as well. This may be their most important benefit. However, they are not as fun to ski fast on groomed slopes, and they are far more difficult on ice. These are difficult trade-offs. 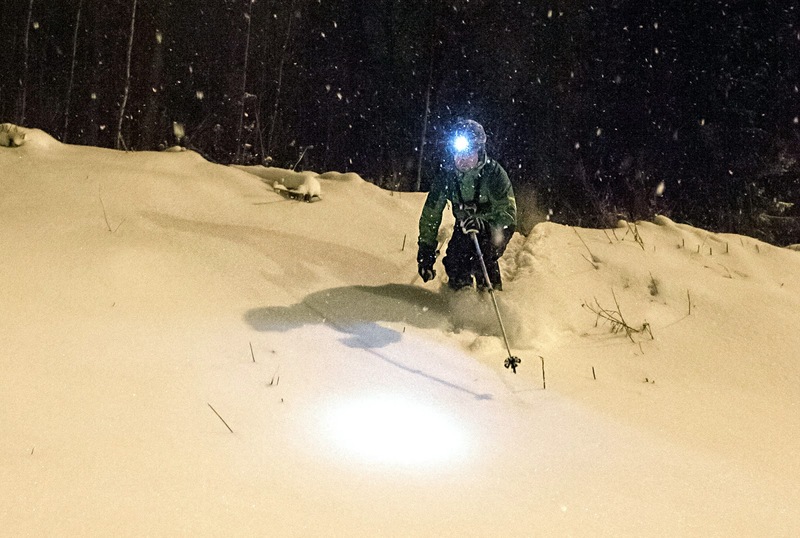 I still plan to use my short and narrow K2 Superlight skis for climbing trips and most dangerous descents. But maybe I should buy on-piste skis as well. But it would be hell to drag three pairs of skis on trips. Particularly when the pair that you want will in any case be in the hotel, unreachable when you really need it. I also noticed a typical early season problem. There may be skiable off-piste routes and even some powder. But there will also be rocks under snow. 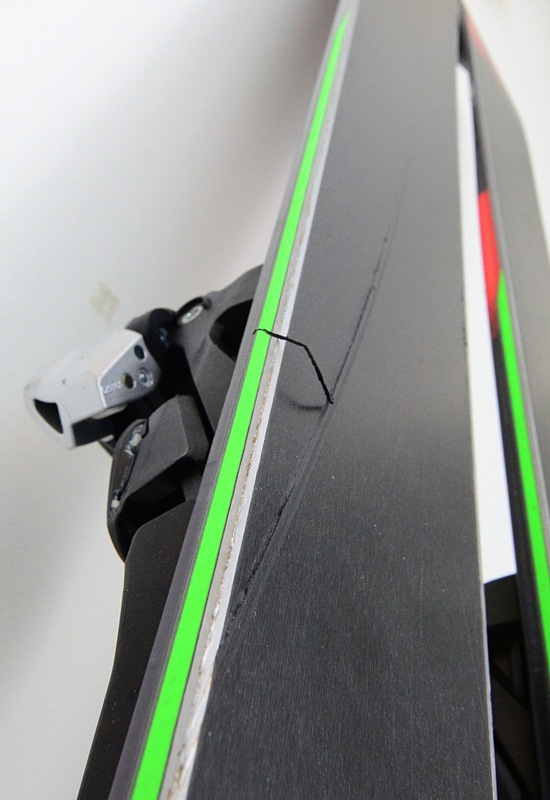 The below picture shows some of the damage my new skis got on their first day of use. I think they can be repaired. 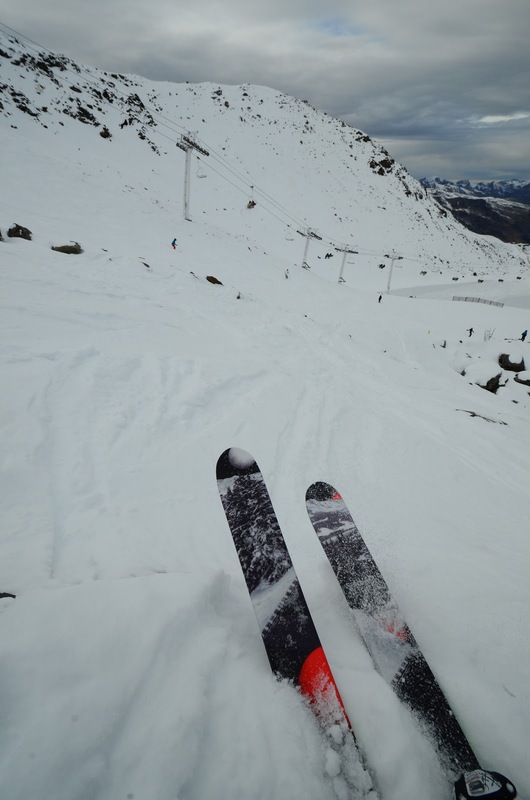 And I went to Val Thorens to ski interesting runs, not to preserve my skis for eternity. My previous skis took this abuse for 5+ years. So no regrets. Incredible pain. For the first hour I suffered. When the boots were tight. When they were open. And I could only ski short stretches before having to stop. Maybe I had bought too small boots? An odd situation, since I tested the boots in the shop for over an hour. But not an entirely unprecedented situation either. The same thing happened with my previous boots and in the end I had to get the shell slightly enlarged to fit my feet. But after the first hour on the slopes, the situation improved. I had no major problems. I may need to test again to see if the boots require modification. 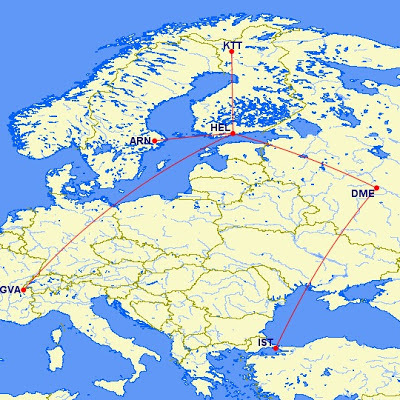 Does it make sense to fly to the Alps on a day trip? 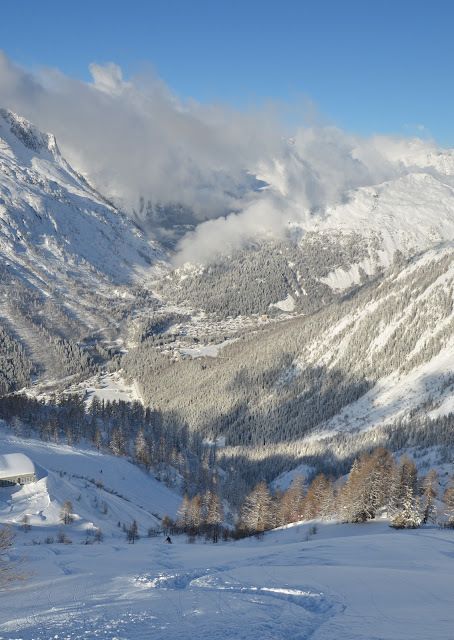 If you are like me, faced with either a day trip or no skiing then the answer might be a yes. I'm certainly glad I made the trip. But I do recommend weekend trips instead. If you can leave Friday evening and arrive Sunday evening, the trip can be much more fun. This year our season opened in November. The first day involved skiing mostly in grass and rock, with just a small bit of snow here and there. 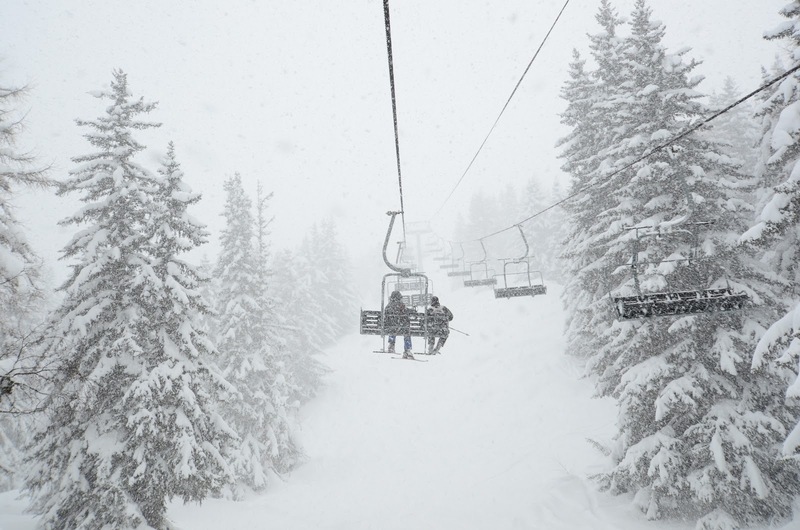 On the second day we had plenty of snow, even a few turns in powder. 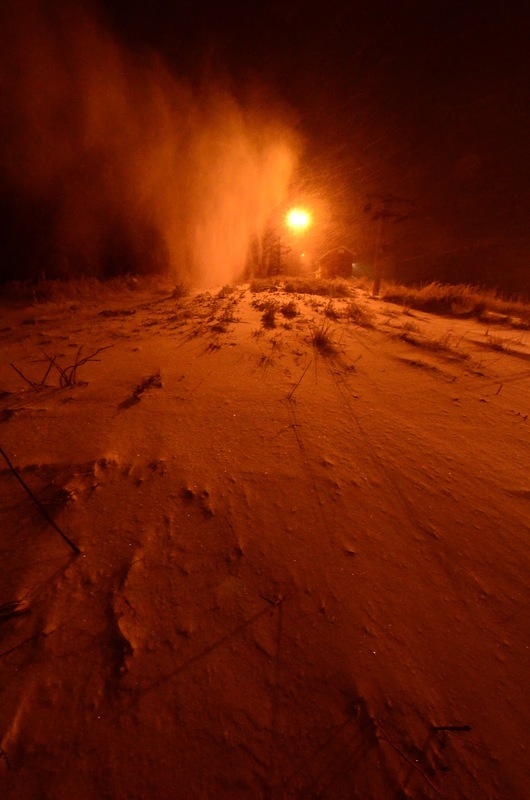 And a strenuous hike up through the blast from the snow making machines, and the two feet of sticky wet snow that they had already been produced in some spots. But it was a wonderful experience. So many people dislike bad weather. I just love it when there's a storm, bad visibility, or night. As long as you deal with safety, clothing, and routing properly, these times can be far more rewarding than outings in sunshine. 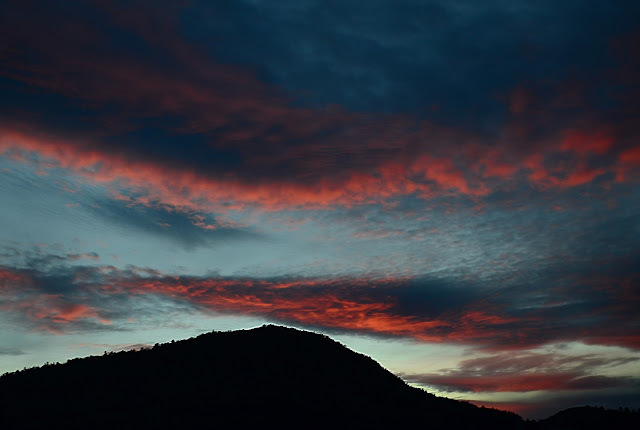 Hopefully the photos in this blog convey some sense of beautiful scenery and colors that we experienced. 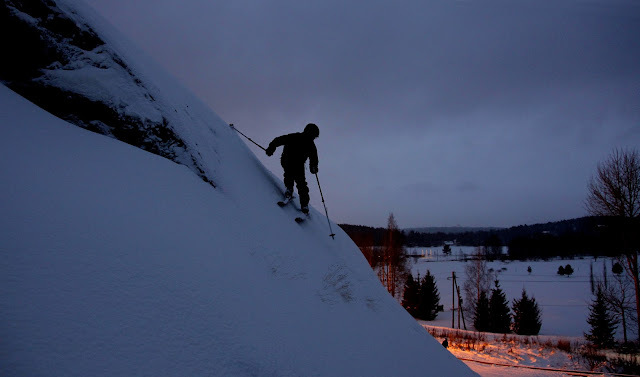 This is a continuation of my earlier story about the local ski hill in Kauniainen. 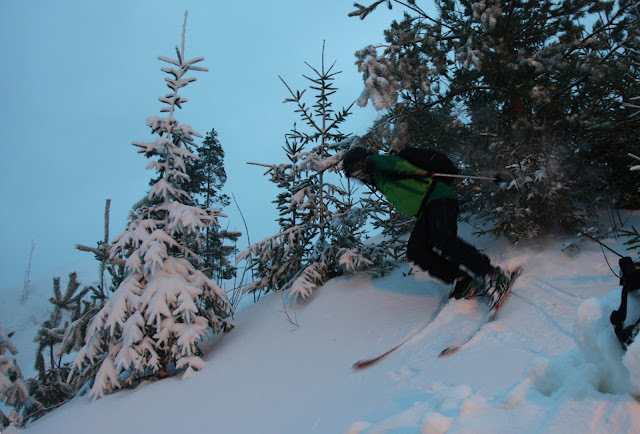 The first skier of the year on the hill was Janne. 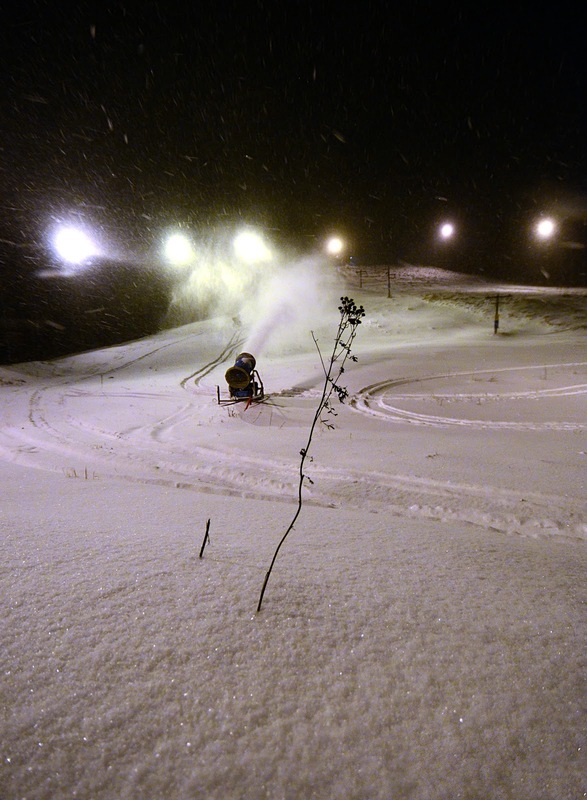 Our first days were on Thursday and Friday, and now Sunday I dropped by the ski area as well. I counted sixteen people on the slope, some on snowboards, some on skis, some with sleds. A very popular hill, considering that it was late in the evening with and the weather was quite cold, -13 degrees Celsius. 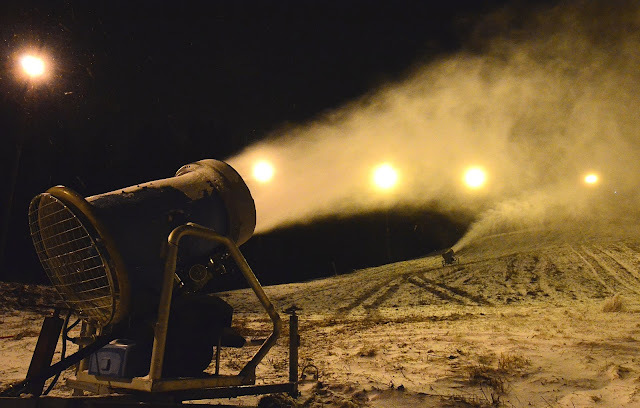 The snow machines are working day and night, and the rumor has it that the ski area might open mid-December.